14k Gold Round and Baguette diamond semi mount. Diamonds alternate round, baguette, then round to create this lovely combination. Diamond weight aprox. .40ct tw, try our loose diamond data base for center diamond pricing. 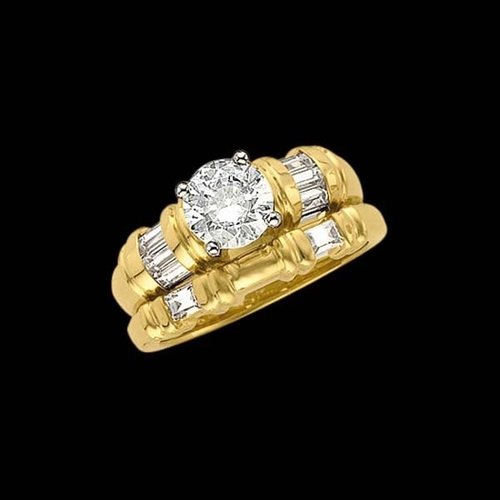 Evening Garden Diamond Semi Mount Ring is 14K Yellow Gold and 1/4ct tw Diamonds. 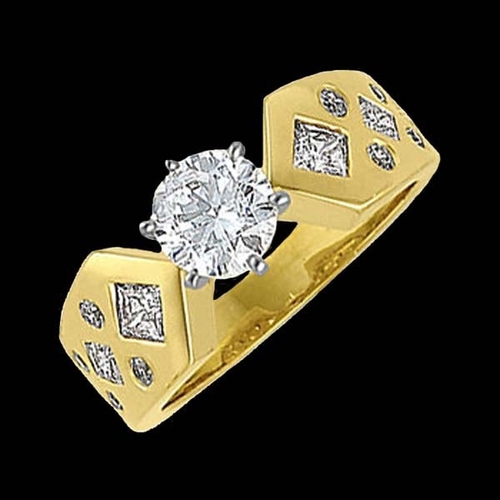 This beautiful ring features a tulip style center mounting for your diamond, that's a lovely match to the gold lattice set with diamond design ring. Order with or without a Center Stone. We also carry a Matching Band for this item. 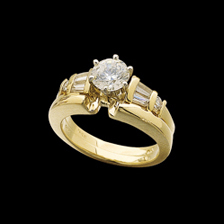 Check out our diamond data base for the perfect center diamond for this ring. We're happy to size this ring, sized rings are custom and non returnable. 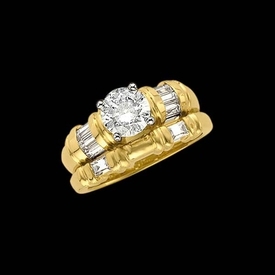 Beautiful 14k Gold Diamond Semi Mount. Princess diamonds are channel set in this lovely engagement ring. Diamonds total 1/4ctw, each measures 1.75mm. Use our incredible diamond data base for a center diamond that will fit this engagement ring perfectly. Stock size 6. Available in any custom size but, custom sizes non returnable. 14k White or Yellow Gold Diamond wedding ring. Diamond in this diamond semi mount total 3/8ctw before the center diamond. Price shown is before the 1ct center diamond. Check our diamond data base for a perfect center stone. Very pretty wedding ring. 14k Gold Diamond Swirl design semi mount. Diamonds total 1/6ctw for the engagement ring, matching diamond band also available. Check out our loose diamond database for a perfect center diamond. Channel set baguette and round diamonds are great accents to the center diamond (not included). Beautiful bridal set. 14k Gold Diamond semi mount. 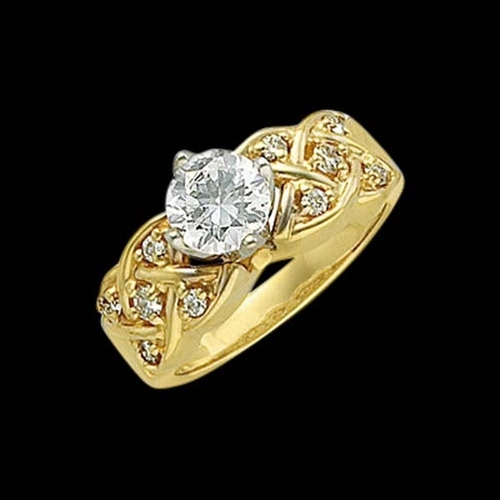 Unique design 14k Yellow Gold 3/4ct tw diamond semi mount. Add your center diamond or select a quality diamond from us. Check our loose diamond data base to find your perfect diamond. (Shown with a 1 ct center, not included). Baguette Diamond semi-mount available in 14k Gold or Platinum choices. This attractive ring style is available in 14k Yellow or White gold. Price is for the engagement semi mount Plus the matching band. Image shown is with a 1 carat center. Diamonds in this lovely diamond semi mount total 3/8ctw. 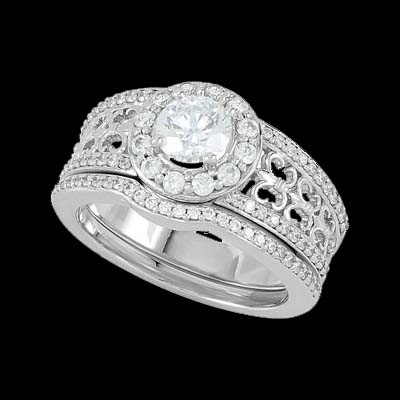 Engagement rings holds 6 baguette diamonds, matching band holds and additional 2 diamonds. Very beautiful ring, check out our diamond data base. Beautiful diamond engagement ring. 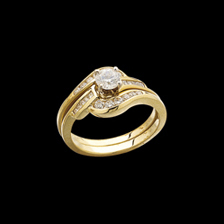 Shown in 14k White gold, this diamond semimount engagement ring is available in 14k yellow gold, 18k golds, and Platinum. This engagement ring features a fleur de lis design on either side of the band and bordered with diamonds. Diamonds also surround the center which will hold your 5.8mm round (3/4 ct.) diamond or gem. Diamonds are SI 1 clarity G-H color and total 1/2ct tw before the center stone. The matching band is also set with diamonds and available. 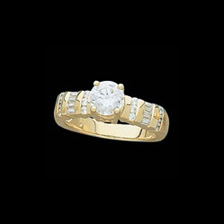 *Be sure to check our loose diamonds to find a perfect diamond for this ring.